Does a new feature give Gmail users control over how emails are used? No. Not really, no (update 2018/05/06: and I found out is even worst than it seemed). Gmail’s new design will include a ‘Confidential Mode’, says The Verge, that, unless I’m really missing something basic, sounds almost useless, and partly misleading. 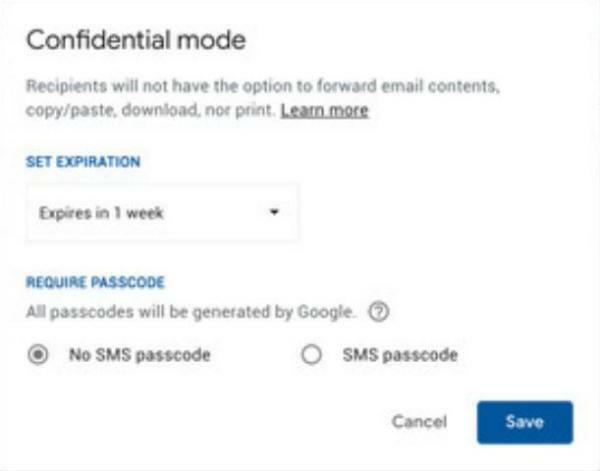 This “Confidential Mode”, says the article, “lets Gmail users stop recipients from forwarding certain emails, or restricts the ability to copy, download, or print them”. Oh, and also “or set an expiration date on sent emails”. if the description above is accurate, that “feature” will limit as intended only recipients who also are Gmail users. If SomeGuy@gmail.com sends an email to an OtherGuy@someotherserver.com, instead, that OtherGuy, using standard email software, will happily print, download and forward everything he wants. No matter how much “confidential mode” was used on the Gmail sending end. You can set all the expiration dates you want, but once an email is in my computer, archived with my software, it stays there as long as I want. and unless it is something completely different from what it seems from the first reports about it, the “Gmail Confidential Mode” is never going to work 100% as intended. [when sending email in "confidential mode"]... You can't stop anybody from taking a picture of the screen of course, but what's maybe more important here is that if anybody ever hacked the recipient’s account, that email with your confidential information will be long gone. “The features of confidential mode come with various positive attributes and a number of limitations, but for some users may also be something else — they may be ILLEGAL for them to actually use!… And it’s important to note that we’re not talking only about the Gmail users themselves.” Full story: “New Gmail Features That May Be ILLEGAL for You to Use!”. Another potential issue with confidential mode that could be a much broader risk to many more persons”is phishing, as explained here.